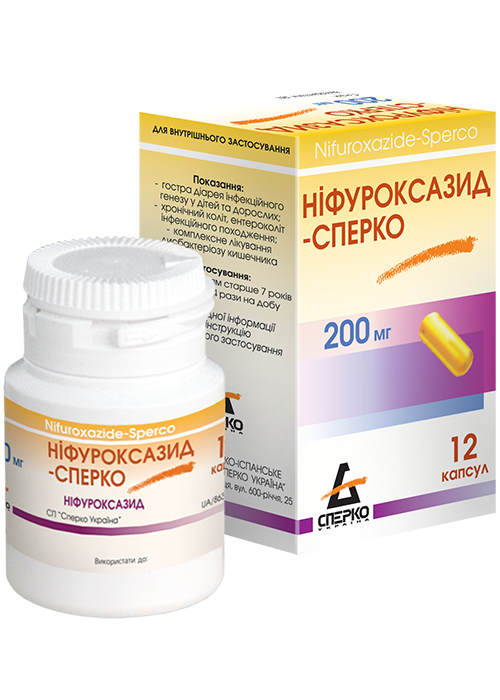 Nifuroxazide-Sperco is an intestinal antiseptic. It is active against most pathogens of intestinal diseases including mutant strains resistant to other antimicrobial agents. Nifuroxazide-Sperco has a bacteriostatic effect at medium therapeutic dosages and demonstrates a bactericidal effect at higher dosages. Drug effect is already observed during the first hours of treatment. It almost does not disrupt the balance of the intestinal microflora at therapeutic dosages. Nifuroxazide-Sperco can also be used for viral intestinal infections to prevent the development of bacterial superinfection. After oral administration the product is practically not absorbed from the gastrointestinal tract thereby creating a high concentration of active substance in the intestine. Due to these properties, Nifuroxazide-Sperco has only topical antiseptic action and does not exhibit any systemic antibacterial activity as well as produce any general toxic effects. For detailed information on the medicinal product Nifuroxazide-Sperco, please see “Package leaflet” page. Marketing authorization of MoH of Ukraine No.UA/8638/01/01 dated 14.06.2013.